This is an excellent source for ordering textbooks. I am always on a budget and I have not paid more than $60 for two books alone yet that originally costs $100 or more. Awesome! 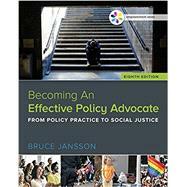 Empowerment Series: Becoming An Effective Policy Advocate: 5 out of 5 stars based on 1 user reviews.